Deciduous trees which shed their leaves on an annual basis (meaning they go dormant during the winter months) produce what's known as hardwood. There are many types of hard wood trees found all around the world, with hundreds of varieties found within North American forests. These trees are often used for hardwood flooring, and each has a distinct color range and grain pattern. 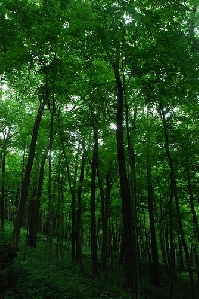 There are tropical hardwoods, which are non-native species to North America. Tropical hardwoods include rosewood, teak, wenge, mahogany, and more, and can be found throughout the world. They will be imported for use from other countries and may differ from their North American counterparts in color, pattern, and overall hardness of the material. In comparison, softwood is wood simply taken from trees which contain needles, instead of leaves. Softwoods are normally used for structural lumber purposes. Below, we'll take a look at hardwood, specifically. What Are the Differences Between Different Species? When looking for different styles of wood products to be used for household repairs, upgrades, furniture, and flooring, it's important to not only note the look and feel of an object, but also the potential durability of it. For each different type of wood, there's an individual cellular structure which will determine how long it lasts, how well it holds up in high traffic areas, and what specific function it should used for, as well. According to the American Hardwood Information Center, the hardness (strength) of woods will vary immensely, with certain species better suited for use in flooring. This will not be the case with certain others, due to the fact that they are in fact not hard enough to take the punishment of heavy wear and tear areas. Ash: Light brown in color and straight grain, ash offers wood to be used in furniture, doors, flooring, baseball bats, moldings, and more. Cherry: Known as a wood that resists both shrinking and warping, it's a great product for those looking to use it in boat trim, cabinet making, furniture, and beyond. It's also known for its ease of use, as well as the fact that it ages nicely. Due to the fact that there's a high demand for cherry products, it is more expensive for the consumer, though. Maple: Maple can be bought in both hard and soft varieties and is used mainly for top of the line quality furniture. Oak: Can be used for furniture, molding, flooring, and more. Poplar: This is one of the least expensive of species and can be used for cabinets and other light construction work. Mahogany: It's a red-brown wood that can be used in boat construction, facings, veneers, and more. It is also an extremely durable species that resists both swelling, warping, and shrinking. Teak: Both hard and durable, teak offers users and manufacturers a great choice, especially within outdoor furniture. It is very resistant to moisture and rot, and because of its popularity, it is a more expensive choice than other such hardwoods. Walnut: Walnut offers a variety of positives for buyers. It's easy to work with, while also being extremely warp and shrink resistant. Due to these facts, it's on the higher price scale, as well. To learn more about renewability, environmental factors, hardwoods versus bamboo, specific terminology, and more, head over to the Hardwood Info site for more information. American Hardwood Information Center: Homepage.